In the quest for success and excellence the victor is most often the gladiator that learns to overcome their obstacles. Learning to not only be good at, but to love obstacles, is a way of life and an attitude. An obstacle is nothing more than a problem that has not yet been solved. When we continually turn away from the obstacles before us they begin to stack up like a pile of rocks in a quarry. Obstacles are good, it’s your attitude about them that stinks. Here is 3 tips for becoming a good obstacle-atition whether you want to improve your marriage, your business, or your health. 1. Put away the auto-pilot thoughts that tell you an obstacle means instant failure. Obstacles should not be the starting gun to run the other way. When you begin to see obstacles as a problem to be solved and commit to sticking to it through to the end success is guaranteed. 2. Stop trying to solve it all on your own. Asking others to be on your team to help solve it will improve the speed at which you solve it. Asking for help is not a failure statement. Working smart by networking with others is a win-win. You will all gain a greater sense of purpose and accomplishment. 3. Approach every obstacle only after a thorough Mind Mapping session. Spend a minimum of 5 minutes brainstorming about possible solutions. I said “solutions”, not problems. Write all of your ideas down on Post-its and post them in an area you can see them. If you get to the point that you have exhausted all ideas and the obstacle is still there, its time for another brainstorming session. Success is not a moment in time. Success is a never quit attitude and a way of life. 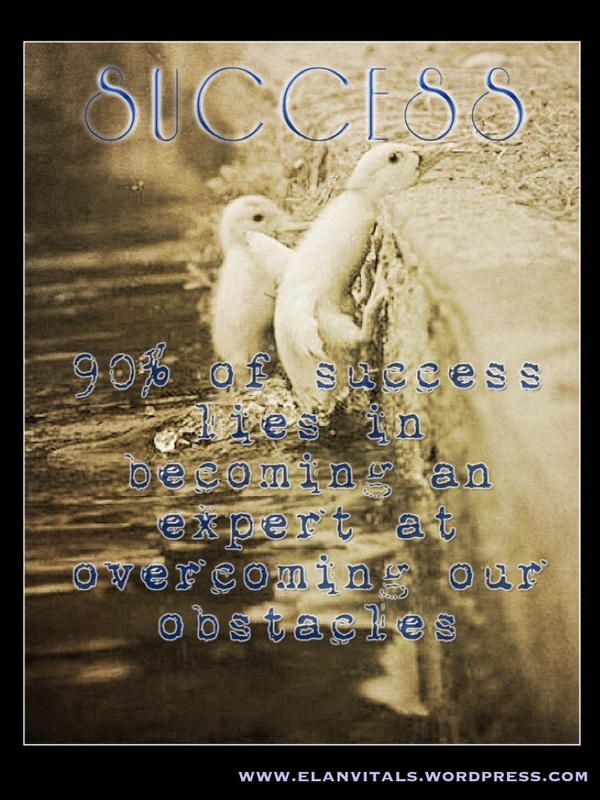 Successful people are successful not in-spite of the obstacles; They are successful because of their obstacles. Also a thing to mention is that an online business administration program is designed for learners to be able to smoothly proceed to bachelors degree programs. The Ninety credit education meets the lower bachelor education requirements and once you earn the associate of arts in BA online, you should have access to the most recent technologies within this field. Some reasons why students would like to get their associate degree in business is because they are interested in the field and want to receive the general schooling necessary in advance of jumping into a bachelor college diploma program. Thanks alot : for the tips you provide inside your blog. Fully agree! Thank you for stopping by! I simply want to say I am just all new to weblog and actually enjoyed you’re web blog. Probably I’m planning to bookmark your website . You actually have really good stories. Regards for revealing your web-site. Thank you for the kind comments, Welcome to the world of blogging. Obstacles are the gifts that build character! Seek them out!